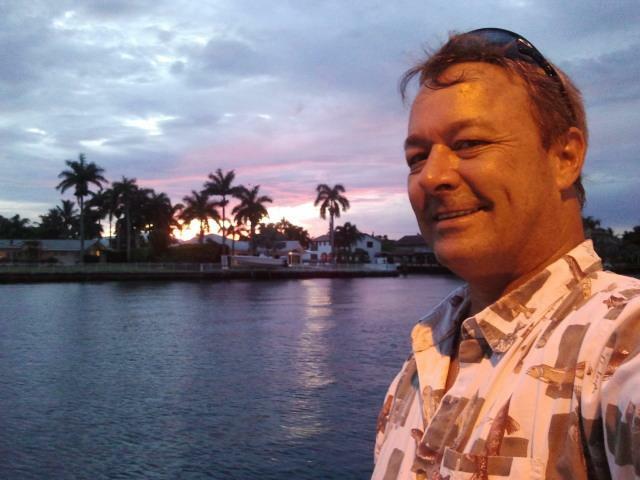 David enjoying an evening by the Inter Coastal Water Ways in Ft. Lauderdale, FL. Most of our properties are rentals and are located in the Winter Haven, FL area.. They tend to be centrally located and close to a lake. There are approximately 50 lake in Winter Haven, FL., so there is water every where. It is a Winter - Haven. Hence the name Winter Haven, FL. We also have some vacant land, well I do, Munir is not big into vacant land these days. We use a property management company to handle most our properties in Winter Haven, FL. Our leases are generally for a 1 year term, we consider all offers but let the PM handle that. Nothing less than 3 months though! It also depends on the property in question? Some bylaws do not allow a short term lease. We are pet friendly as a rule, again, it depends on the bylaws. But the pet must pass our own pet test. With Home Owner Insurance companies checking to see if you are renting to people with aggressive breeds. I actually had to sign a form saying the tenant did not have an aggressive breed. Hmmm, a 10 year old blonde lab. I don't think that is an aggressive breed. We like to know how the pet acts around people? If it is a dog, is it a barker? And the size of the pet? We like 20lbs or less. As we know people may fudge a 1/2 pound or so on their pets weight. Wink, wink. Check out or properties we have listed and if you see something that interest you? Please click on the Customer Service link to contact us. Someone we will get back in touch with you. I must say, good rentals do not generally stay on the market that long around here. Just click on the property link to go to that properties page for more pictures and information on it. They are listed in the order we acquired them. Lake Howard House - This is our top luxury rental. When someone rents this beauty, they do not want to leave it. And we are not ready to sell our pride and joy. It is a single story, concrete block, 1894 sq ft 3 bedroom, 2 bathroom house located on Historic Lake Howard. It has a 2 car garage and plenty of driveway parking. There is a huge fenced in back yard that is great for children or pets. This wonderful home was made for a family. The New Lake Howard Trail is being built right now and will be a walking / biking path around the lake. Casa Del Sol Townhouse - This is a great two story 1344 sq ft townhouse that sits off of Lake Hartridge. It has 3 bedrooms and two and a half bathrooms. There is a nice private court yard out front and two screened patios off the back side and it has a two car garage with a little work shop area in it There is a little laundry room off the kitchen. This complex has two pools. One is for adults and one is for children. The large one is for children and sits off of Lake Hartridge. There is a large clubhouse that can be rented out as well. The screened in patio on the bottom floor and the screened in patio off of the Master Bedroom, look out onto the court yard and the Adult Pool. Lake Buckeye Condominiums - This is a nice clean 2 bedroom - 2 bathroom - 1100 sq ft condo located within the Lake Buckeye Condominiums community. The condo's are located off Lake Buckeye, a private lake and are off NE 11th St. This condo is very close to Polk State College and Lake Elbert. It is centrally located on the NE side of town. There is a beautiful pool down by the lake and a nice smaller clubhouse. It is a quite community and well maintained. The concrete block buildings were built to last. Ave J NW - Ave J NW is the newest addition to the collection. This one is owned by McBrayer Investment Trust LLC. A new company was formed by David so he could get financing on some of the investment properties. Like this one. Ave J NW is close to a few of our properties and close to Lake Howard and the New Walking/Biking Path that goes partially around Lake Howard. They are just about to complete it. Now one of the differences in this property is a General Contractor was hired to handle the rehab since David can't handle it with his limitations. So Scott Shelton of Shelton Construction is handling the job which will entail a new flat roof, new soffit, new AC system, remodeled bathroom, tree removal and trimming, restoring the Terrazzo flooring, plumbing and electrical work, painting inside and out and a new fence. Yes, it is quite a project. But the house was bought at a good price, it is in a neighborhood that is coming back around and is close to everything. Ave J NW Triplex - This is one of our newest additions to our collection. It is a 2000 sq ft triplex that consist of a 2-1 1600 sq ft house in the front with a 1-1 running long the back of it. Then there is a 384 sq ft free standing 1-1 house/apartment. We are doing some updates but tenants were in place. This is very close to the house we just rehabbed. We think this will be a great addition to the collection. It is on a double lot and has a chain link fence around the back of it.